Known as “the Painter of Snow,” Walter Koeniger was the son of an architect, born in Germany on May 6, 1881. From architecture, Walter turned to painting, while still in Germany. He studied under Eugene Gustav Dücker (1841-1916) and Eduard Karl Franz Gebhardt (1838-1925) at the Düsseldorf Academy. Dücker studied at the Imperial Art Academy of St. Petersburg and was influenced by Russian realism. Gebhardt, also a student in St. Petersburg, developed more into a genre and history painter. Around 1912, Koeniger settled in Woodstock, New York, where he abandoned Dücker’s crisp, photographic realism for a more painterly, expressive technique. He concentrated on capturing the fleeting moods of nature during a period when the winter scene genre was rapidly rising in popularity. Koeniger focused on views of the Catskill Mountains and wooded areas around Woodstock and Saugerties. He painted in broad, large strokes, rendering brilliant sunlight and glowing color harmonies, soft gradations of color in the sky, streams and forests. For G. Frank Muller (1925), Koeniger attempted “to convey to the beholder the rapture he experiences before nature at her best. Koeniger seizes the delight of woodland beauties and passes it on for our enjoyment.” The artist adapted the blue and purple shadows of the impressionist aesthetic. Reportedly, Koeniger would delay the completion of a painting until the setting sun would add the proper tint of orange to the scene. Vose Galleries featured Koeniger’s works in December of 1926. 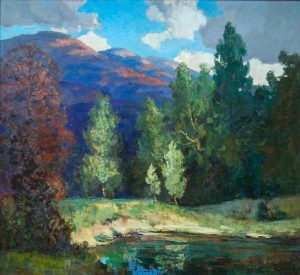 That year he began to exhibit his landscapes at the National Academy of Design where he returned in 1929, 1930, and 1931. His activities at Woodstock (where he died in 1943) are not well known; apparently he was not involved with the artists’ colony there. Koeniger was a member of the Salmagundi Club. Muller, G. Frank, “Koeniger, Painter of Snow,” International Studio 81 (June 1925): 210-215; Zellman, Michael David, 300 Years of American Art. Secaucus, NJ: Wellfleet Press, 1987, p. 773. Submitted by Richard H. Love and Michael Preston Worley, Ph.D.